Enter the fly-zone - the ultimate nature experience! 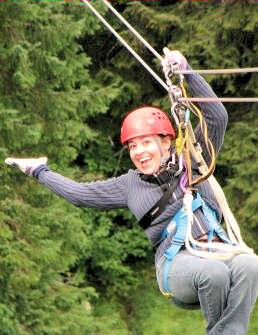 Imagine the thrill of gliding through the top of a rich rainforest canopy along a series of dual cable zip lines, aerial bridges suspended between tall spruce, and hemlock and cedar trees bordering the magnificent Tongass National Forest. This major rainforest reserve embraces one of Alaska's richest salmon spawning streams and a pristine inter-tidal estuary. Abundant wildlife habitats include a high concentration of bald eagles, black bear, and a variety of other species. At Herring Cove your all-terrain custom 4x4 Unimog will transport you up a steep rainforest hillside to the canopy chalet. Here your professionally trained guides outfit you with state of the art safety equipment and provide a detailed orientation prior to zipping from the first platform. Size really does matter! Your rainforest canopy challenge features a flight over at least seven ziplines and one suspension bridge - 6,000 feet of high tension cables and ground-based nature trails. Your guides will progressively ease you into the forest canopy along cables ranging from a short 100 feet to some over 700 feet. Guests often see eagles and bears from the tree platforms. You will be up to 135 feet above the forest floor! Throughout this award-winning adventure you will be surrounded by the sights and sounds of the rainforest wildlife reserve. After completing the zip line course, gear-down at the base camp where you will be presented with a custom medal in recognition of your achievement. Upon completion of this once in a lifetime experience, enjoy a complimentary snack and hot beverage, view your photograph and shop in the General Store. A narration is provided on the scenic 16 mile round-trip coastal drive. Although wildlife sightings are frequent, they cannot be guaranteed. All necessary gear including harnesses, helmets, lanyards, gloves, and rain gear is provided. Complimentary snack, coffee, tea and hot chocolate in general store. Achievement medal awarded at conclusion of tour. Min. height 60", min. weight 90 lbs., max weight 250 lbs. General good health, no history of back or neck injuries, full use of all limbs, no history of seizures, comfortable with heights, not pregnant, able to communicate and understand directions in English, must fill out a waiver. Long pants and layered clothing recommended. Closed toe shoes required. Rain jackets provided.